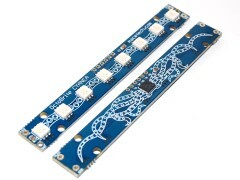 Les has just uploaded WS2812B RGB LED controller library! I have played with the SSD1306 Library and it works very well. Thanks! Even now, after years of working within this industry, LEDs have a fascination to me. And an LED matrix is something that I can't wait to try out. A LOL Shield (Lots Of LEDs Shield) for an Arduino board was purchased and I set to work creating a Charlieplexed interface for it from the Amicus18 board, which will physically accept any Arduino shield, and allows programs to be written in Proton BASIC. I've been meaning to write a "Game of Life" simulation for many years, but I could never find the right motivation. That is, until I discovered the Sure 2416 LED dot matrix board. Browsing the internet, I came across a rather nice looking LED dot matrix board, and the price was incredibly low. The board in question is the Sure 2416, and is available from Ebay. I couldn't resist buying one. All those flashing LEDs!